Day 20 on the tour and today we are visiting Jessica from The Bluestockings Society, Naida from The Bookworm, BookClover and Book Thingo. Each year I try to buy at least one new Christmas decoration for the tree. Some years it is a ball with the year painted on it. Other years it has been something else. This year, I have not one new decoration but six! The main reason for having six is that when I went to the shops last weekend, one of the department stores already had 40% off of their decorations, so I bought four! 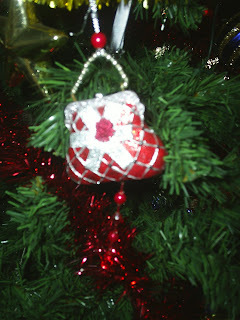 The other two came from a couple of family members who went to Sydney earlier in the month and bought decorations back. 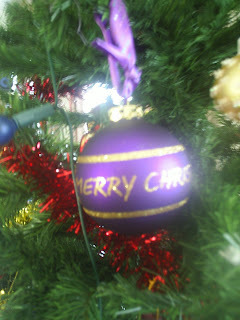 The ones that I bought were three wise men and a purple and gold year bauble. This is one of the gifts. 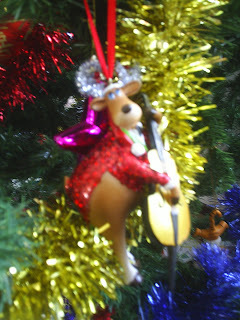 At first glance I thought it was a kangaroo but a closer look tells me it is actually a reindeer. We won't mention my inability to recognise the national emblem okay? The tail should have been a clue! This one is one that I was given last night. I really need a new bag, although I don't think that this one will fit many books in it, which is the top criteria I have for buying new handbags! Strictly speaking you're not supposed to get this until Christmas Day, but we figured a bunch of people might be away visting, and whatnot, at that time, so we're sending them out, now. I guess it's awards season for you, Marg - I've got one for you over at my blog, too! Your ornaments are beautiful. Enjoy reading your blog. haha, I gave you an award too. The same one as Julia, though. 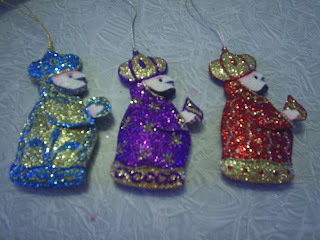 Oh, I love the wise men ornaments! Thanks for sharing your new ornaments. Great articles and thanks for the tips on the crime books love those. Check out my movie reviews and let me know what you think.